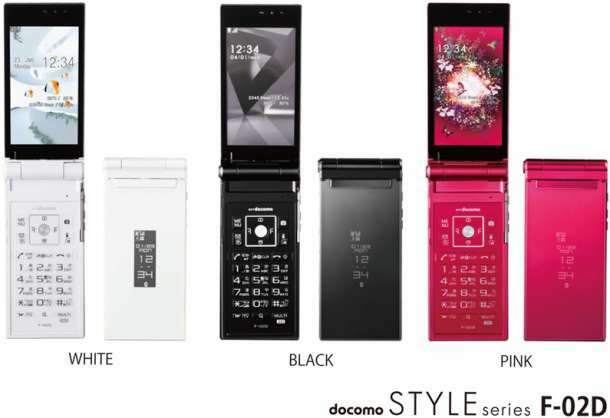 Tokyo, November 9, 2011 — Fujitsu today announced that its new docomo STYLE series F-02D mobile phone will be available in Japan from NTT DOCOMO, Inc. beginning November 11, 2011. Beyond being fully equipped with a wide range of features found on conventional mobile phones, F-02D pushes the limits of high-spec mobile handsets by delivering an even further advanced assortment of capabilities. F-02D is equipped with a 1.2 GHz CPU—among the fastest of its class—and a quick-response touchscreen, thereby enabling speedy operations. At the same time, the stylish and slim 13.9-inch handset incorporates some of the most advanced features available on a mobile phone, including a 16.3 megapixel camera, Wi-Fi® connectivity, fingerprint sensor, full-featured electronic dictionary, 3D capabilities, "human centric" features, and water-resistant technology. The result is a spectacular handset that offers users all the features they are looking for. Amid a rapidly expanding smartphone market in Japan, many customers still prefer the comfort of mobile handsets that they are accustomed to using. There is an increasing need for advanced functionality that surpasses that of smartphones. To meet these needs, Fujitsu has developed the docomo STYLE series F-02D, which combines all of the sophisticated, high-performance capabilities the company has developed to date, including touchscreen, camera, full-featured browser, fingerprint sensor, and other kinds of technologies. F-02D is equipped with a 1.2 GHz CPU, which boasts among the highest processing performance of its class. This allows users to enjoy speedy hardware responsiveness in any scenario. Moreover, the mobile phone's quick-response touchscreen enables easy operations. With a smart browser(1) enabling web browsing functionality equivalent to that of a PC browser, users can also enjoy all the conveniences of normal web browsing. In addition to the handset's 13.9mm water-resistant form factor, F-02D also employs a new hinge design that brings together a one-touch open mechanism and a rotating dual-axis construction, representing the culmination of Fujitsu's mobile phone design know-how. As a result, F-02D delivers the ultimate ease of use for a clamshell phone. Furthermore, to comprehensively meet the needs of mobile phone users, F-02D sports a number of fine-tuned and convenient features found only on Fujitsu's mobile phones, including a Privacy Mode® using proprietary Fujitsu technology and eye-catching illuminations. It also features water- (IPX5/IPX8) and dust-resistant (IP5X) technology(3). F-02D is available in three colors: WHITE, BLACK, and PINK. In addition to a conventional full-featured browser, F-02D includes a smart browser that can quickly display webpages and supports a user interface for touch-based operations. The included "WebKit" rendering engine delivers the same user-friendliness as PC and smartphone browsers and is compatible with a large percentage of websites, thereby enabling easy operations. Moreover, the browser can quickly load desired functions and can simultaneously display content screens and thumbnails. The mobile phone's high-performance 1.2 GHzCPU delivers a stress-free operating environment, making launching applications and video playback smooth. • Equipped with both "Exmor®R for mobile" and "Milbeaut® Mobile"
The mobile phone is equipped with an "Exmor®R for mobile" back-illuminated CMOS sensor along with the high-resolution "Milbeaut Mobile" image processing engine. The combination of these two advanced features enables photographs to be captured with even higher sensitivity and lower noise, thereby allowing for stunning high-resolution photographs and videos. The mobile phone's screen can be rotated 270º (180º clockwise, 90º counterclockwise). This allows users to keep a close eye on the composition of the photograph while shooting. Video filming feature that allows playback at speeds two times faster than normal viewing. This feature can be used at the same time as the Art Camera creating fast-paced moving images for the viewer's enjoyment. F-02D's 3D mode can easily be enjoyed with the simple touch of a button. By switching photographs, applications and the wallpaper to 3D mode, users can add fresh and stylish accents to the phone. • "Super HAKKIRI VOICE (extra-clear voice) 3" and "PITTARI VOICE (exact voice)"
In addition to "Super HAKKIRI VOICE 3," which makes the receiver easier to hear in a crowded environment, the phone also employs "PITTARI VOICE" to adjust the handset's volume to an optimum level based on the user's body movements, such as when walking or running. F-02D features greatly-improved noise canceling performance, ensuring that the user's voice is transmitted clearly. The handset has a built-in fingerprint sensor that is resistant to water and dust. By recording the user's fingerprint in advance, the mobile phone identifies its owner through fingerprint authentication, in lieu of having to type in a 4-8 digit password. This security feature provides peace of mind by enabling information about designated individuals or groups to be kept hidden. When an e-mail or a phone message arrives from an individual whose communications have been designated as secret, the user is notified instead through the phone's battery icon. In addition, the user is able to choose whether or not to enable the pattern recognition function of the phone's predictive text input capabilities when the privacy mode feature is turned off. A password can be configured for the mobile phone's microSD™ card (sold separately) or microSDHC™ card (sold separately). Therefore, even if the handset is lost or stolen and the card is removed, it will not be able to be read on another PC or mobile phone, thereby reducing the remote risk of important personal information being leaked. The mobile phone is equipped with two lock features: a "closed lock", which can lock the keypad and touch-based operations each time the handset is closed; and a "screen-off lock," which can lock the keypad and touch-based operations once the screen has been off for a certain period of time. Supported devices: PCs - Fujitsu brand LIFEBOOK/ESPRIMO model PCs beginning with those released in summer 2011 (some exceptions apply). PCs from other manufacturers can be used with Windows Vista® or Windows® 7 + F-LINK software.